The art installation at the new 96th St. stationhouse has been designed by Antenna Design and Urbahn Architects. The New York City subway system is not known for its gentle sounds. Rather, the screech of metal on metal, the incessant whir of air conditioners struggling to work, the feedback loops produced by sub-par public address systems and the constant exhortations to “stand clear of the closing doors” provide a dissonant soundtrack to our daily trips underground. What if, though, our wait for a train wasn’t marked by the rush of an express but rather the chirping of crickets and the sounds of the good old outdoors? Can art in the subways actually serve to calm harried New Yorkers? If the MTA gives its approval to an Arts for Transit plan, the new stationhouse at 96th St. and Broadway set to open late next year will feature a soundtrack of sounds from nature and other elements designed to slow down frantic straphangers. By the fall of 2010, when construction on the station is expected to be complete, subway riders will enter an arched glass-and-steel structure housing an exhibit that is a striking contrast to the traditional tile mosaics and sculptures that populate the underground rail system. Nearly 200 stainless-steel flowers will hang 12 feet above the turnstiles, mounted in staggered patterns across seven ceiling beams. The flowers, weighing about three pounds apiece, will be allowed to sway slightly, creating the effect of a shimmering garden levitating above the stairways that lead down to the platforms. The nature noises, which are pending final review by the authority’s staff, would be focused by directional speakers on small areas of the station, allowing riders to “walk through” the sounds. The modern garden and its accompanying soundtrack are a tribute to the geographic provenance of the 96th Street station, which was built in 1904 in a neighborhood known as Bloomingdale, after a Dutch word translated as “vale of flowers.” Although the station now sits amid rows of high-rise apartment buildings and noisy intersections, the hilly area was once known for its picturesque natural landscape. “The installation is a memento of nature past, so that subway riders may be reminded of a time before the area became an urban neighborhood,” the designers, Sigi Moeslinger and Masamichi Udagawa, wrote in an introductory note. Now, before New Yorkers not used to change in their morning routines get all bent out of shape, the two designers — working under the name Antenna Designs — are veterans of the subway system. They have designed the R142, R142A and R143 cars currently in use on various Transit lines, and for better or worse, they produced the MetroCard Vending Machine designs as well. They promise that this new exhibit will fit in perfectly. Before the MTA can sign off on it, they have to ensure that the chirping crickets are ADA compliant. The sounds can’t be too loud so as to block out important — and not-so-important — public address announcements in the station, and the visually-impaired must be able to hear the MetroCard Vending Machines’ automated instructions. Still, with a sound installation in place on the B/D/F/V platform at Herald Square, this latest proposal is probably heading for approval. After all, we could use a few more crickets in New York City anyway. A screaming siren and the screech of brakes aren’t the most comforting of sounds. Click for a video of the Masstransiscope and an old quote that still rings true. The 86th St. station on the West Side IRT has long been decorated with mosaic versions of paintings. While the third graders’ art at 59th St. have long been removed, these tiled paintings at 86th St. still give the station a more artistic feel. Today, Times reporter Martin Espinoza chats with some of the artists about the origins of the paintings and what these drawings mean to them 20 years later. It’s a nice New York story about some good that came out of an Arts for Transit program. In my illustrated tour of the new South Ferry terminal, I talked extensively about MTA’s $1 million Arts for Transit investment in the new station. Today, The Times talked with Mike and Doug Starns, the 47-year-old, Brooklyn-based identical twins responsible for the decorations, about their vision for new stop. They talk about the trees, the map and the difficulties of working with fused glass on a subway station-sized scale. Check it out. When the Washingotn Post published the Tom Toles cartoon above on July 3, a few loyal Second Ave. Sagas readers e-mailed it to me and noted how the idea can apply to the MTA also. The MTA, often more concerned with putting on a pretty face, spends money on luxuries instead of on more frequent service, some might contend. I’m particularly intrigued by the notion here that station art may come at the expense of more reliable travel and service. In my opinion, station art and the MTA’s Arts for Transit programs are positives. They beautify stations that may otherwise may appear dour and depressing. The cost outlay is minimal compared to the amount the MTA spends on station upkeep, and scraping the program wouldn’t automatically provide the entire city with frequent service at all hours of the day. Every weekend, when Friday rolls around and these weekend service advisories mount up, we complain about the the slow and hard-to-follow service. While I agree with others that service has seemed less-than-exceptional lately, I don’t think the answer to the MTA’s service woes is to scrap the Arts programs. The answer, instead, lies in securing adequate funding for the system through the congestion fee. As the odds of that worsen, we’ll just have to deal with a system strained to its economic limits. And now your weekend service summary: New changes on the Q; still no 4 service between Brooklyn Bridge and Atlantic Ave.; and the West Side IRT express trains are running local. As always, everything else is here. We’ve had some serious weeks around here at Second Ave. Sagas. Resignations and track worker safety make for somber posts. But today, we’re all about music because it’s time, once again, for the Music Under New York Auditions. All day today, from 9 a.m. until 4:30 p.m. in Grand Central Terminal’s Vanderbilt Hall, musicians will take to the stage an in effort to win one of the coveted spots in the Music Under New York program. The MTA announced this morning that over 70 musicians and musical groups will take to the stage during the seven and a half hour gala with poet Bob Holman, the self-proclaimed Ringmaster of the Spoken Word, serving as emcee. 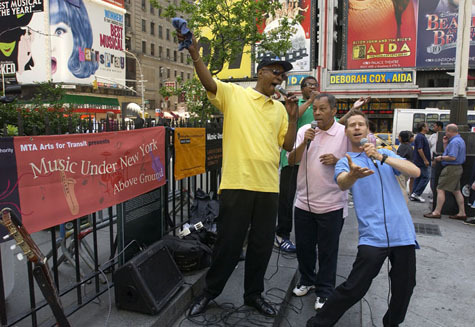 As part of Arts for Transit, the MTA’s award-winning arts program that is supposed to increase the attractiveness of the otherwise-drab subways, Music Under New York licenses over 100 musical artists of varying genres and styles. According to the program’s Website, MUNY holds open auditions once a year, and the five-minute time slots feature some highly competitive artists and a tough slate of judges. The lucky ones who pass the audition gain acceptance into the program. They receive one of those personalized banners with their name that sanctions the performance and permission to play in one of the designated Music Under New York locations. If you’re around the Grand Central Terminal area today, duck in for a few minutes and catch some of these bands. You’re bound to see something off-the-wall, and while I’m sure some of the musicians are terrible, others are quite qualified. A glance through the list of last year’s crop of new artists accepted to MUNY reveal an urban jug band called Brotherhood of the Jug Band Blues, a dance artist going by the name Little Michael Jackson and the Renaissance Street Singers, a group performing early sacred music. So much like a ride on the subways, you never what sort of eclectic entertainment you’ll come across at these auditions. No matter; it’s gotta be better than a mindless 9 hours in the ol’ cubicle anyway. Riders of the Manhattan-bound B and Q trains know there’s something out there. Shortly before the trains go above ground on the Manhattan Bridge, alert riders can spot a glimpse of…something. It’s not a solid tunnel wall; daylight streams through a series of slits in a temporary wall blocking whatever it is that’s there. Two hundred twenty-five hand-painted panels sit behind those mysterious slits. When viewed properly and at the right speed, those panels form a picture. It’s a life-sized subway zoetrope. But the Masstransiscope has fallen on hard times. Installed in the 1980s by filmmaker Bill Brand, the piece, as any astute rider may notice, is completely obscured by graffiti. Now, Brand wants to restore his zoetrope. Originally installed at a price tag of $60,000 and through the aid of the NEA and the New York state Council on the Arts, Brand estimates it could cost up to $40,000 to restore it, and the MTA’s Arts for Transit program can’t cover the restoration costs. “Around 1990, we fixed it up,” said Sandra Bloodworth, director of the MTA’s Arts for Transit program. At that time only the light bulbs needed to be replaced, and the MTA received a donation of bulbs. Now, however, the electrical work needs to be entirely redone. Arts for Transit isn’t willing to shell out the estimated $35,000-$40,000 for restoration. While twenty years ago, Brand convinced graffiti artists to tag elsewhere simply by asking nicely, times have changed. Graffiti in the subways is no longer about the art of graffiti; instead, it’s about tagging a name on as much MTA property as possible. And Brand knows he would face an uphill battle to keep the Masstransiscope viewable. The MTA will coordinate the restoration. Now, Brand just has to raise some money to restore an interesting work of art that would lend some color to an otherwise sluggish ride from Brooklyn to Manhattan. Hat tip to Brooklyn Record.